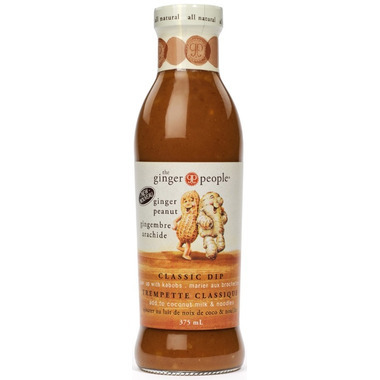 The Ginger People Ginger Peanut Sauce is a rich, nutty and yummy dip served with chicken or beef kabobs. Or simply add it to coconut milk and slivers of red bell peppers, then pour over noodles. Chill, sprinkle fresh cilantro on top and you've got yourself a quick and easy Thai noodle salad. 2 tbsp. contain 25 calories, 1g fat, 0mg cholesterol, 190mg sodium, 4g carbohydrates, 2g sugar, 1g protein. Ingredients: Water, apple cider vinegar, soy sauce (water, wheat, soybeans, salt), roasted peanut flour, ginger, evaporated cane juice, modified corn starch, honey, red jalapeno pepper (citric acid added), sesame oil, roasted garlic (citric acid added), expeller pressed canola oil, spice, dehydrated onion, salt.